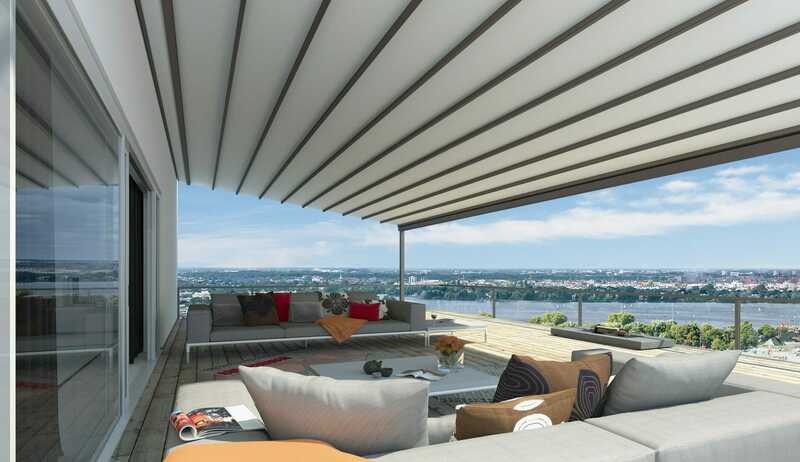 Our textile roofs make enjoying outdoor living easy and more welcoming. Whatever the weather you will always be ready to roll back the roof and enjoy the sun or roll it out to give cover or shade. All carried out by the click of a button. 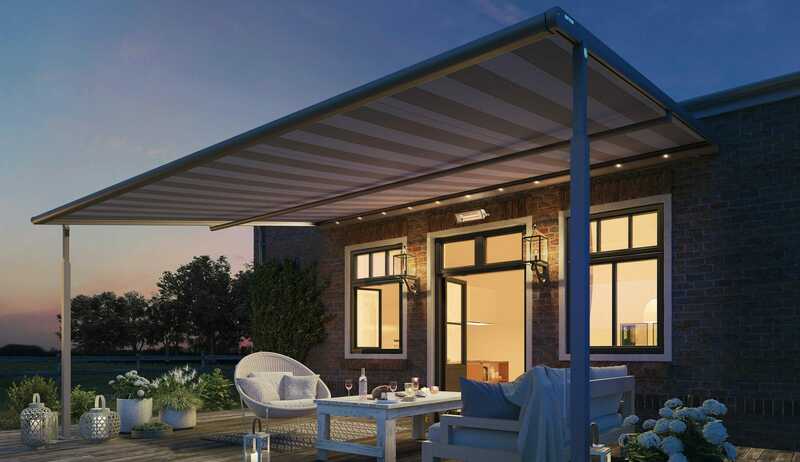 Prepare for longer days outside in your garden thanks to our stylish, strong and popular awnings. Our textile roofs come in two beautiful styles, The Viola and The Protea. The Protea has been snow tested up to 550kg making it one of the strongest textile roofs available. The Viola can be installed with a shallow pitch whilst still being usable in rain due to its mechanical dropdown leg. 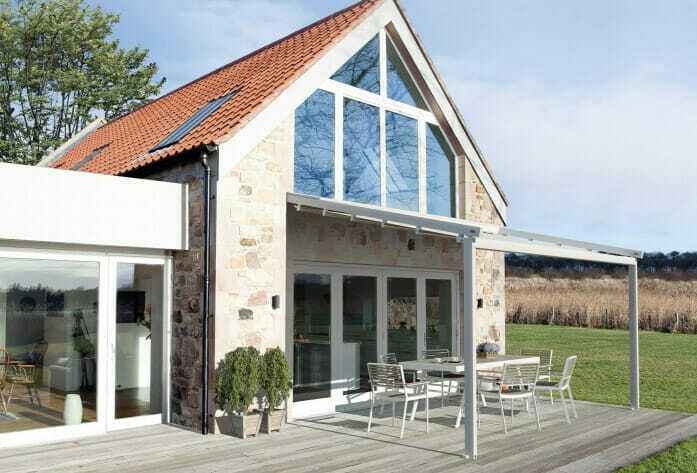 Both roofs benefit from an array of design and colour possibilities - with many frame colours and fabric styles, you will find one ideally suited to your home. 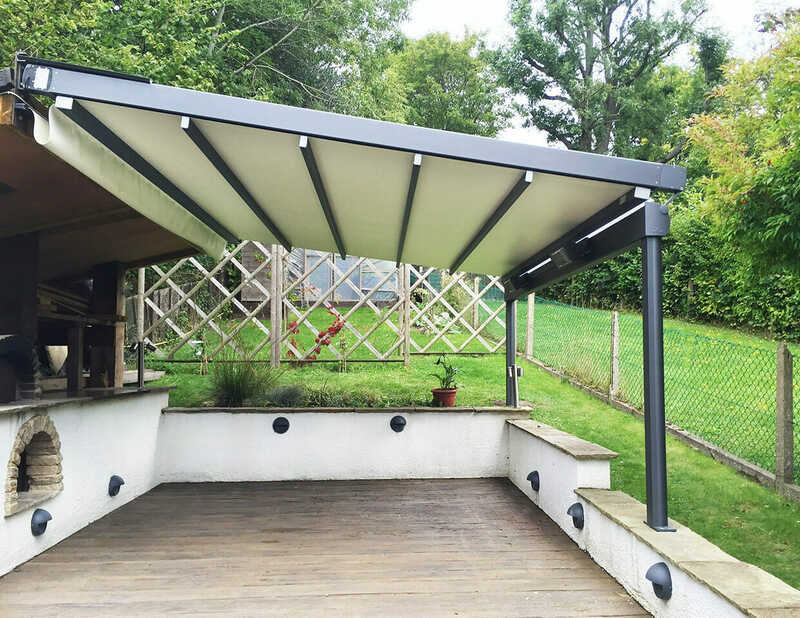 Textile roofs are a great option to provide sheltered weather protection all year round and are fully retractable with an easy to use remote control putting you in charge of your environment. Our designs guarantee great results and no parts used in the installation of your textile roof will be ‘off the shelf’, meaning your design is truly bespoke. 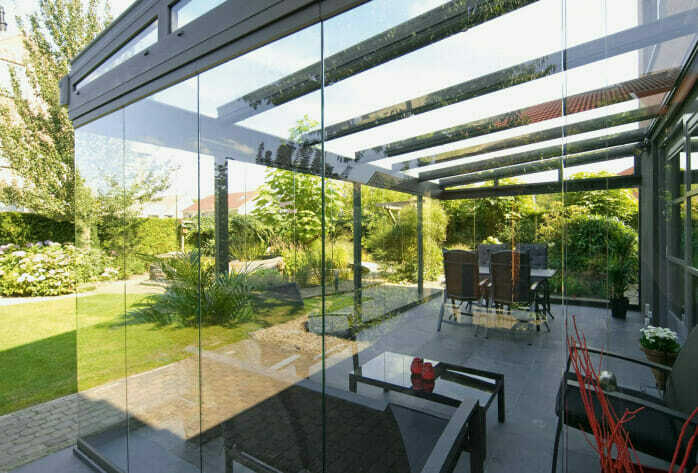 You can even create a room by adding frameless side glazing to The Protea to give your outdoor living space a real wow factor. Our textile roofs are manufactured with style, safety, versatility and ease of use in mind. With a variety of fabric colours and a range of RAL colours, you are sure to find the ideal look for your textile roof. The latest nanotechnology allows dirt to simply roll off. The roof fabric comes with a protective coating on a microscopic level. Hi-Clean Nano-technology means it is dirt resistant and water-repellent. Rain and other liquids do not cling on to the fabric but roll off leaving no trace. Our remote-controlled LED lighting options extend the amount of time you can use your Textile Roofs in the evening. Lighting is integrated into the structure, creating a warm and atmospheric light. Thanks to the two front posts it is extremely wind resistant. 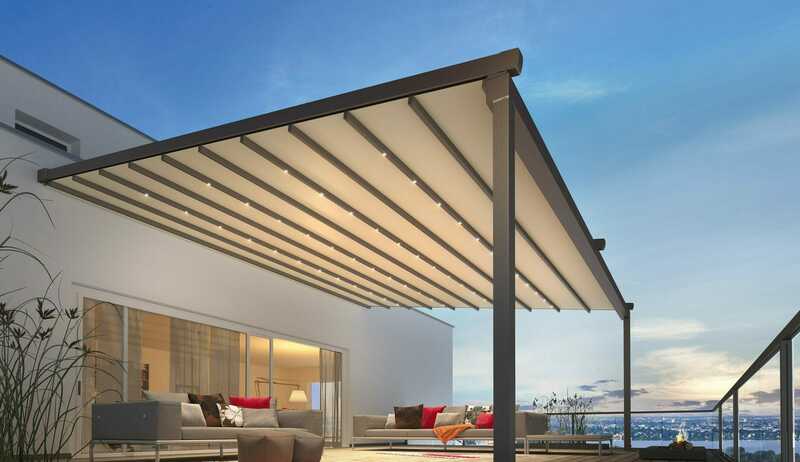 The stable structure guarantees that our textile roofs can remain extended up to wind force 6. Can a textile roof be shaded or glazed on the sides? The Proteas has the ability to be fully closed in using sliding glass doors or retractable shades on all sides making your textile roof into a enclosed space. The Viola can be supplied with a retractable screen on the front only. How does rain water run off a retractable textile roof? The Protea has integrated guttering in the front structural beam that drains away though a hidden drainpipe within the post. The Viola textile roof does not have a drainage system. Rainwater simply runs off to the side that has been lowered via the adjustable post. Can I add Lighting and heaters to my retractable textile roof at a later date? You can add heating products at any stage but as the lighting is integrated into the aluminium structure these have to be purchased with your initial purchase. 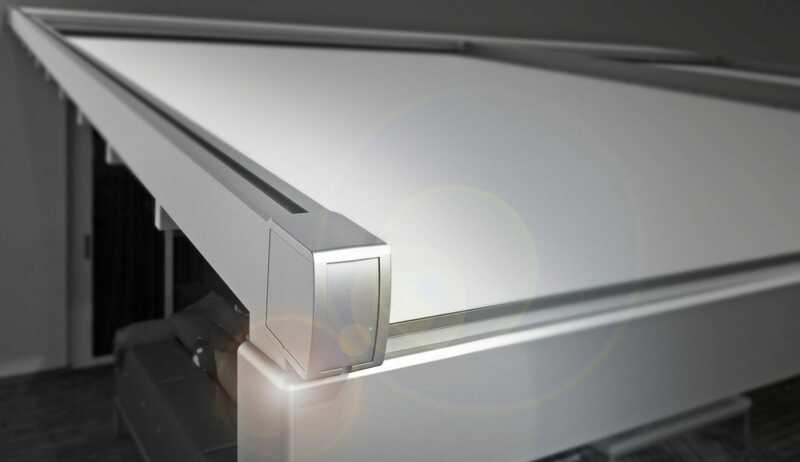 However, we can retrofit a LED light bar to your retractable louvered roof at later date. How do I operate a textile roof? Both the Viola and the Protea are motorised as standard and controlled via a handheld remote or a wireless wall mounted switch. 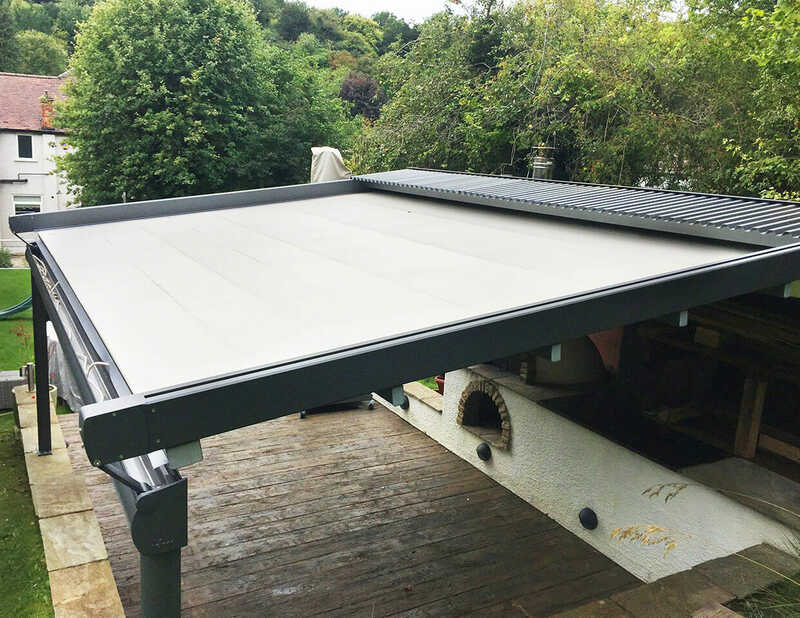 In this case one of our retractable textile roof systems are exactly the right choice to make that will turn your garden into an all weather room. They provide shelter from the elements, while being fully retractable, enabling you to enjoy alfresco dining throughout the year. There are options to add integrated lighting and heating as well as side screens for added protection. We love to entertain people at our home, and we enjoy sitting in our garden to eat. Over recent years we used different parasols to try to provide some shade in the summer, but they never covered everyone and were useless in the rain. 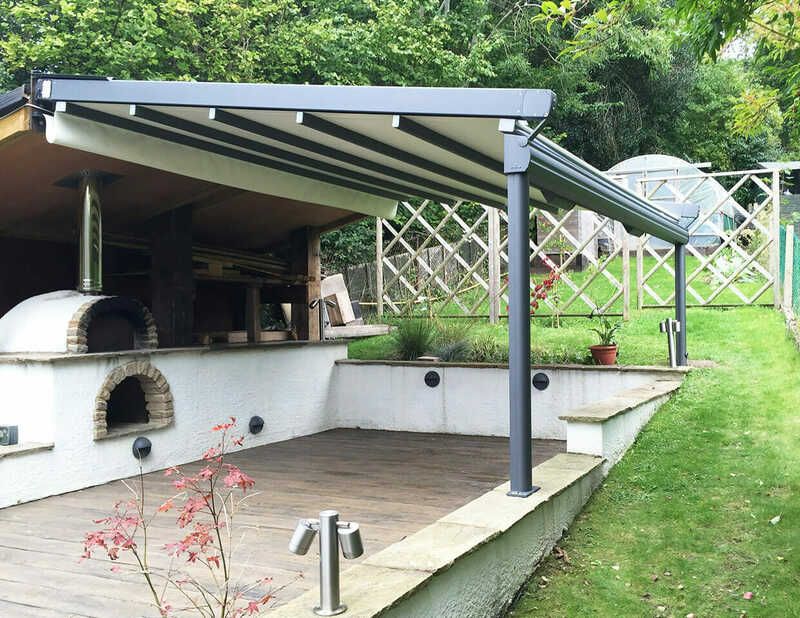 The Outdoor Living Group provided the perfect solution with a textile roof which was ideal for us and allowed us to entertain regardless of the weather. We recommended a textile roof system because of the clients’ need to shade a larger area, as well as provide rain protection. The PVC cover, similar to the material used for marquees, is extended via a remote control and held at a particular tension, making it possible for the roof to disperse of rainwater at a shallow pitch of 8 degrees. The clients’ outdoor living experience was enhanced by two high powered eco-friendly patio heaters. 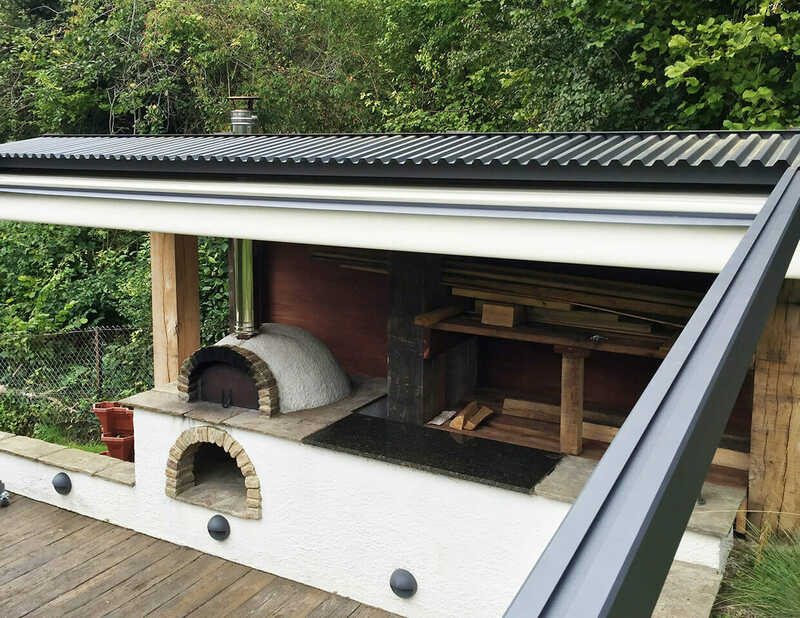 There is no doubt in our minds from our first few meals outside that the addition of the retractable roof will allow us to use our garden and pizza oven most of the year thanks to the great service and advice that The Glass Room Company provided. If you’d like more information on any of our products we can send you a brochure or we’re always happy to have an informal, no obligation chat over the phone. We have a wide range of products to suit any home and requirements - check out our full range to see which would best suit your lifestyle.